WordPress themes represent very cheap alternatives to website design from scratch, which can be very costly. Many low-budget business owners are able to establish an online presence because of WordPress and the cost-effective premium themes and plugins. The design and layout of your website is the most important consideration that will affect the fundamental functionality of your website. For instance, if your goal is to write articles, then you must pick wordPress themes that is going to help your post excerpts stand out in the home page for a beautiful design and style to attract visitors. If you want to sell products or services, then you are better off with a wordPress theme that highlights your products or services rather than your article posts. When designing a website using WordPress or other platforms, one of the most important things to consider is browser compatibility. Remember that there are quite a few browsers out there, and users will have their own preferences. Therefore, it is important to think about this cross-browser compatibility when picking a theme for your wordPress site. If you are buying a premium WordPress theme, the first thing to do is to download the most common browsers such as Google Chrome, Microsoft Explorer (evolved from Internet Explorer), Firefox, Opera, and Safari. Once you install each of these browsers, try the theme demo on each of them to test for compatibility. How a User experiences your website during the first 15-30 seconds is probably the most important determinant of the time the visitor will stay on your website and whether s/he will return. As part of the user experience, easy navigation is one of the most important aspects. It affects the ability of the user to find important information about your website and what your website visitor is looking for. So it your website should be easy to navigate. Your site navigation should not be confusing to your site visitors. It is probably not good to annoy your users with pop-up information, particularly if this is not what they are looking for. So your navigation should send your visitors to exactly where they expect to go based on the menu text. Cyberchimps themes: Hummingbird Web Solutions acquired CyberChimps in 2015. CyberChimps is a team of web experts from around the world who possess extensive WordPress experience. The company was built on the same open-source principles as WordPress itself. CyberChimps believes in supporting customers, designing premium products that just work, and giving back to the greater WordPress community. These WordPress themes and plugins (total 53) are very versatile to Apps for customizing for every page. We use a Cyberchimps theme to build Webmastersmarket.net; so you can see for yourself. Templatic themes: If you have a web design business, this is definitely one of the best membership clubs to belong to. It has over 100 high-quality WordPress themes and plugins, most of which are highly specialized money-making niches such as classified, directory, ask (Q&A), and lots, lots more. Once you have access for $299, you can download everything, but for continuing support, there is a $19 monthly fee. Considering what you can do with these themes, that is still a bargain! 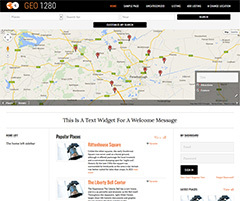 With the exquisite GeoDirectory theme/plugin, you can easily turn any WordPress theme into a rocket-fast single-location (free of charge) business directory with Multi Locations add-on available), maps, user reviews and a lot more. You will be able to quickly create a Yelp or TripAdvisor clone by just drag and drop activities. With this plugin or theme, you are only a few clicks away from challenging the world’s biggest internet directories. Plugin Hunt Theme: This allows you to create a clone of the very popular Product Hunt with your WordPress site for just $79.